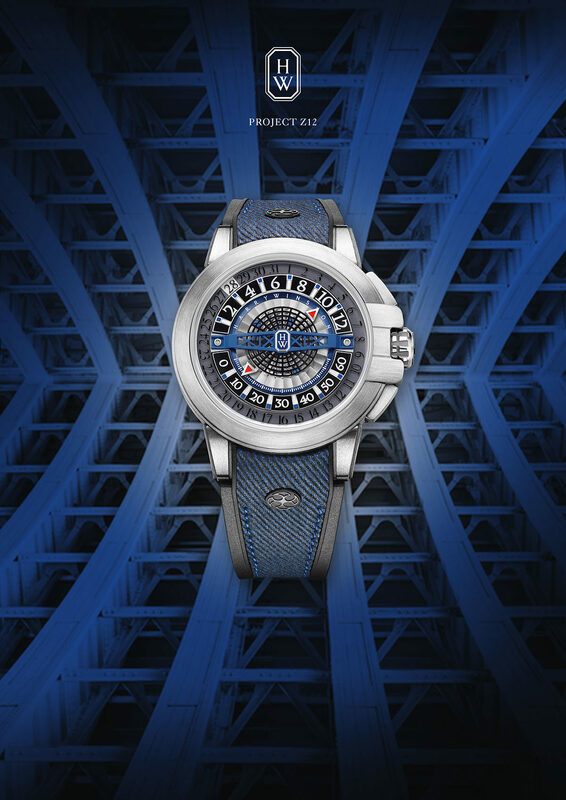 The Harry Winston Project Z12 is immediately recognisable for its architectural dial which displays retrograde hours and minutes in a unconventional concentric and subtly asymmetric layout. Placed under a large, openwork blue bridge, the hours and minutes hands do not simply move but jump over a 140-degree field. When each reaches the end of its rotation, it jumps back. In total, this retrograde choreography occurs 26 times a day, right in the middle of overlapping circles. The date is displayed on a disc located on the edge of the dial. 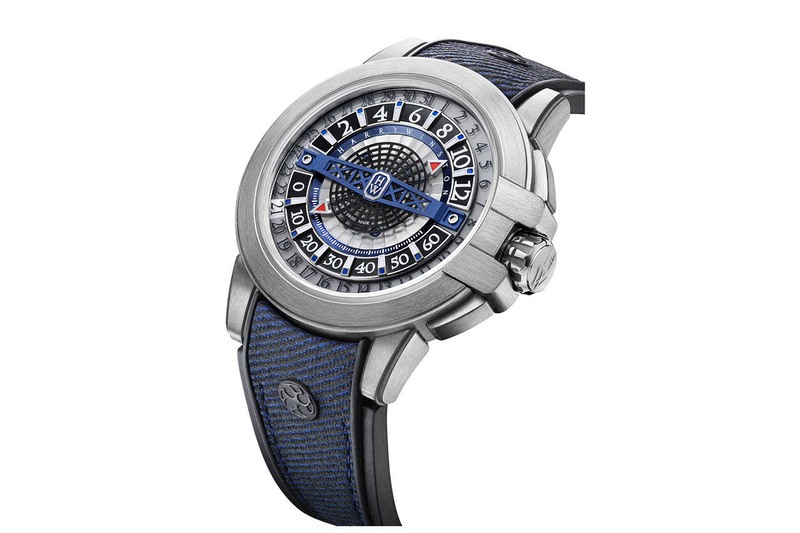 This sapphire disc is fixed and punctuated by transfers bearing numbers between 1 and 31. Luminescent material moves beneath its surface to illuminate the date. The protruding element of Project Z12 is the large, arched bridge that straddles the central axis of the dial. Evoking the unyielding structures of Manhattan’s great bridges, the timepiece recalls Harry Winston’s New York City heritage. At the centre of this bridge is the Harry Winston emerald, its signature hallmark and a recurrent design featured on its timepieces. The colour theme of the Project Z12 is blue. 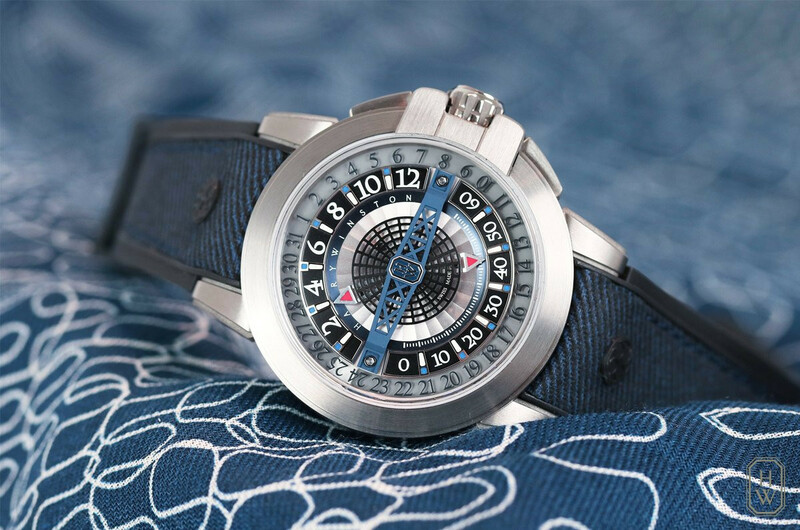 Blue is the central bridge and blue is the calfskin strap featuring a print reminiscent of a denim weave. 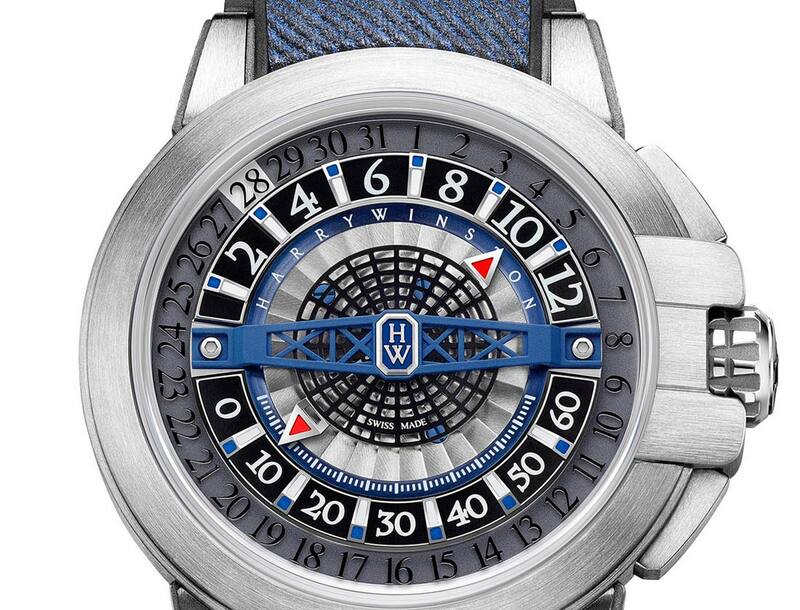 Blue can also be found on the rim surrounding the hour and minute circle, as well as the matching hour markers. 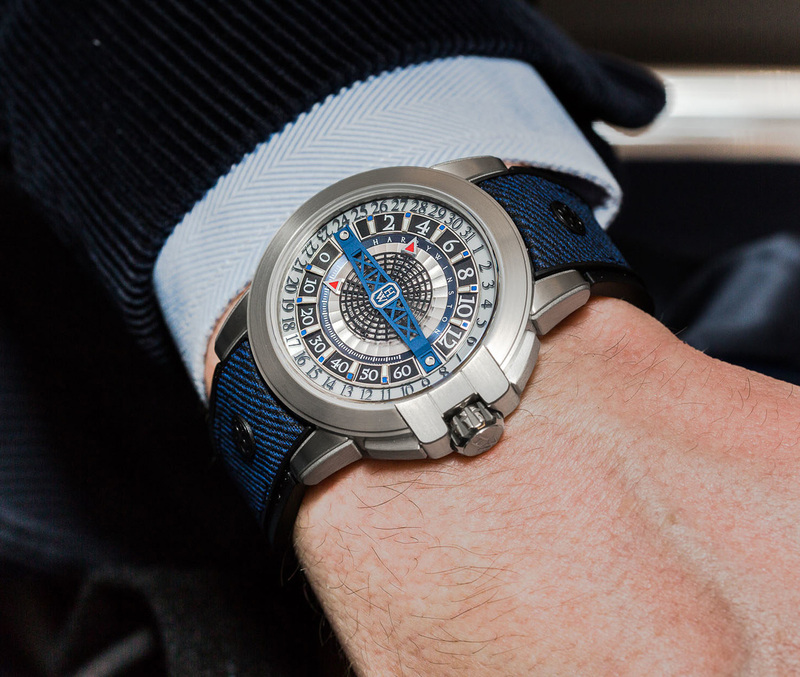 In keeping with the tradition established fourteen years ago by Harry Winston, the timepiece is housed in a 42.2 mm round case made of Zalium, a trademark of the brand to describe an ultra-light alloy of aluminium and zirconium. The three arches surrounding the crown are a nod to the entrance of Harry Winston’s historic Fifth Avenue Flagship Salon. 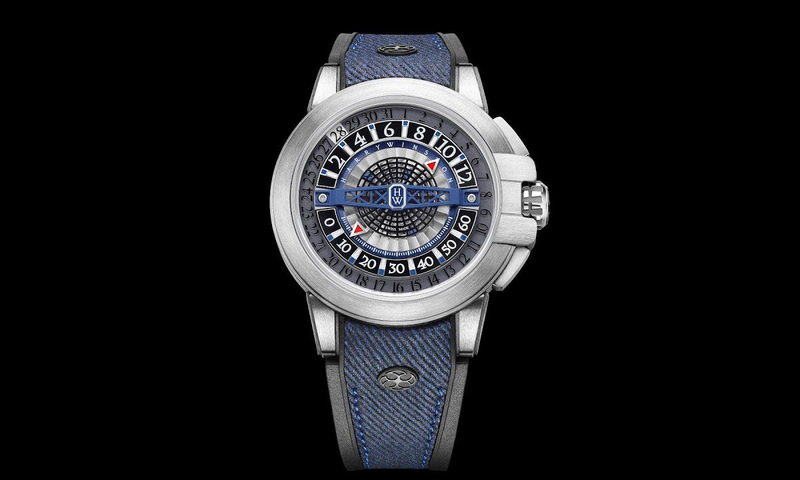 Waterproof to a depth of 100 metres / 300 feet, the case showcases the brand-new movement through a sapphire crystal case back. Developed exclusively for Project Z12, the HW3306 automatic calibre beats at a frequency of 4 Hz (28,800 vph) and offers a power reserve of up to 68 hours. This movement is fitted with a silicon balance spring as well as a white gold rotor with circular Cotes de Geneve decoration. 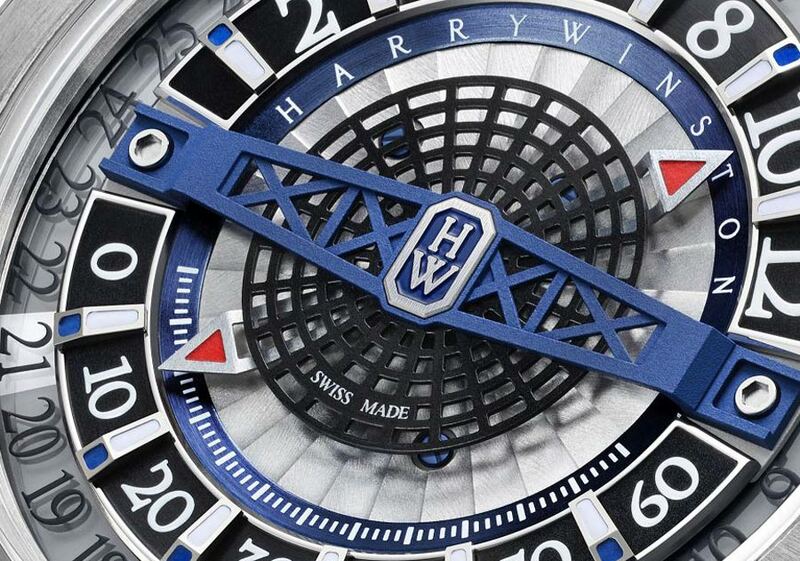 The Harry Winston Project Z12 is a limited edition of 300 pieces with a price of Swiss Francs 24,500. And be sure to check TOP 25 luxury watch brands for men and TOP 10 most expensive watches in the world.